Lucille Kennedy reflects on how Jenny, a core member in the L’Arche Preston Community, is gifted at ensuring people are not lost at the edges of our society and are seen human beings. Four years ago I embarked on a research project for a Masters in Health Psychology. I had just read a PhD paper by Jani Klotz. Three of her siblings were labelled with severe and profound learning disabilities. Reading Jani’s paper opened my eyes to some of the ways we value our community members in L’Arche and provided a new language to express the importance of their lives. As a result, it led me to conduct a piece of inclusive research with four of our community members in Preston. Jenny was one of them. In her paper, Jani mused on one of the important things her sister spends time doing — collecting tiny bits and pieces from her environment and carrying them around with her. At night she would spread the bits and pieces out on her bed in a particular order. This was something she had always done but, when she left her parents’ home to live in a group house, this behaviour was labelled as obsessive compulsive and seen as unhealthy (as it also seemed to cause some soreness in her hand). To address this, her care team decided to control Jani’s sister’s access to her bits and pieces, and insist she carry them around with her in a small purse. The family was instructed that they must also be consistent with this regime when she visited them. Jani ignores the instruction. She doesn’t understand what it is her sister is doing, but she knows it is something of great importance to her. She recounts seeing the deep contentment in her sister when she has settled down in bed with her bits and pieces ordered around her. She feels it is her sister’s vocation to do this. Her sister’s vocation? This struck a deep chord with me when I thought about all my friends in L’Arche who engage in behaviours that we don’t understand, and may try to control, but which are crucial to their individual well-being. While I was reading about Jani’s sister, the television was on in front of me showing the diving competition at the Commonwealth Games. Men and women spend huge amounts of time every day climbing up a ladder and onto a diving board to jump off in one way or another. They do this over and over again. It is completely pointless, but they get really, really good at it by doing it all the time. They win medals for doing this. This set me thinking about why we value some repetitive behaviours and yet pathologise other behaviours as obsessive compulsive. What is it that drives the desire to do something, even when others try to prevent it, or make it difficult? How is this linked to our vocation and why each of us was created? So let’s hear from Jenny; a wonderful and amazing woman who lives in L’Arche Preston. Jenny likes to carry a disposable plastic bag, which contains papers of one sort or another. Anyone who knows Jenny will know how important her bag of papers is to her. Sometimes the papers are raffle tickets, sometimes envelopes, or flyers. Jenny’s focus throughout the day is to keep this collection safe and she will spend time ordering and organizing it. How is this related to Jenny’s vocation? To explore this question, the two of us met for a couple of hours a week for a six-week period and played with paper. I brought coloured paper, shiny paper, holographic paper, textured paper, notebooks, folders, envelopes and a scrap book. I collected magazines and brought pens, glue, scissors and some shaped punches. I put all this stuff on the table and sat with Jenny to see what happened. One of the things Jenny made a beeline for were the shaped punches. Jenny loved using them and cut out many shapes. She put the shapes very carefully into a folder, ensuring none were lost. I started to gather all the bits of paper from which the shapes had been cut, to throw away. Jenny showed signs of distress at this point and it became clear that it was important to her to keep the ‘relief’ of the shape also, so all the bits of paper went into the folder for safety. This was a real ‘a-ha’ moment for me as I realized that Jenny wanted to rescue all the things that I throw away. To her these are of value. All the things that Jenny carries around with her are things I treat as valueless. I began to see Jenny’s precious bag of paper more like a piece of art work, like Tracey Emin’s ‘My Bed’; something visual which makes a statement about contemporary society. During the six weeks we worked together, there was a regional community gathering. At the gathering there was a young man, Thomas, and his parents, who were exploring L’Arche as a place for Thomas to live. Thomas has profound and multiple disabilities and was, therefore, the person in the room most vulnerable to exclusion. Jenny sat next to him. At one point in the conversation, Thomas’ parents were talking about going away for the weekend. Jenny immediately began to display the same anxiety that she showed when we missed rescuing a piece of paper from the floor and she said to Thomas’ parents: ‘You are going to take Thomas with you, aren’t you?’ This was the moment that I realized that Jenny wasn’t just alert to paper being lost, but was in fact aware of anything and anyone who may be lost at the edges and may be vulnerable to being ‘thrown away’. 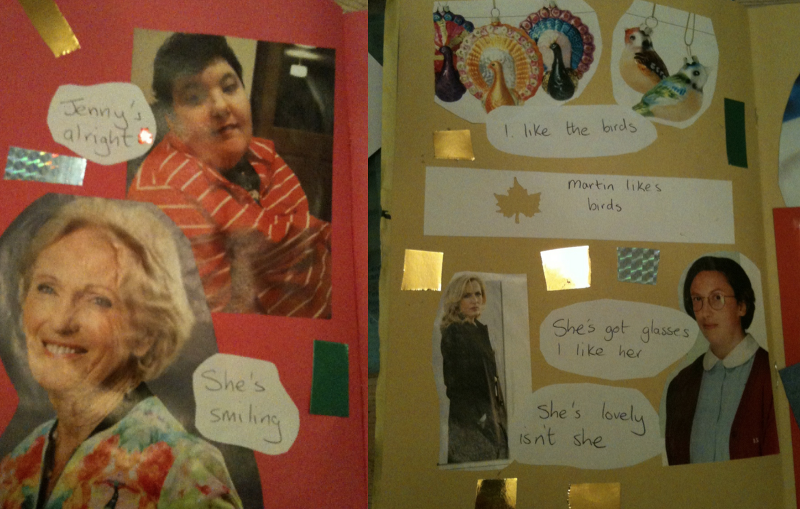 In our last session we stuck all of Jenny’s work into a scrapbook. This included all the paper she had cut and many pictures that she had chosen to cut out from magazines. This meant that I had a body of work on which I could carry out a thematic analysis. One of the striking things I noticed when looking at Jenny’s scrapbook was how it was full of pictures of women. The only picture of a man in the entire scrapbook was a tiny picture of Barry Norman’s head. Jenny likes men, many of her friends are men, her dad is her great hero, but in her world it is women who she notices doing the important things and women’s work that she values. After I had given birth to my son Gabriel, I was on maternity leave and one evening when at L’Arche Preston Jenny said to me: ‘You’re working with Gabriel tomorrow, are you?’ I nearly wept at Jenny’s recognition of what I was doing as a mother, in a culture which regards full-time motherhood as not working. In the same way that Tom Daley can do extraordinary things between leaving the diving board and hitting the water, Jenny is also extraordinary in her abilities to spot and act on exclusion and marginalization. Jenny hones her skills and expertise all the time, noticing what and who is vulnerable to being lost at the edges, excluded, or thrown away. She then acts on this in her own determined way, challenging the rest of us to see our world and our values in a new light. Is this why Jenny has been put on this earth? Is this her vocation? I think it is. Lucille Kennedy was a part of the L’Arche Preston Community for many years. She is now part of L’Arche Brecon. L’Arche Kolkata has been telling stories since it began in 1973. There are the founding stories, and the funny stories, and the hard and heartbreaking stories. Rosie, from L'Arche in Ipswich, reflects on her first year in L'Arche, and how the Community improved the way she feels in herself. In November 2018, L'Arche UK hosted a public event at the Wellcome Collection in London, exploring the role of intentional communities like L'Arche in creating places of belonging in a time of loneliness. and, because of that, I’m learning to love it when I’m not. Léon van Ommen, a theology lecturer at the University of Aberdeen, wanted to know what we mean when we — as L’Arche — talk about joy.